Hei, hauskat pukit vauhdissa jälleen. Viikonlopun viettoon, vähän lahjaostoksia ja korttien kirjoittamista ja toivottavasti paljon unta! 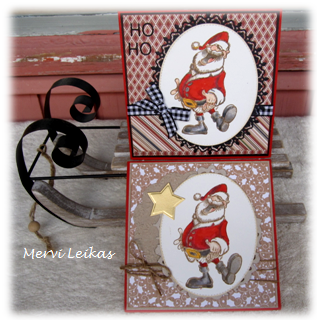 Hi, Friday Santa here again, two cards with Make it Crafty stamp. Versafine black ink, clear ep, coloured with ProMarkers. Frame Spellbinders'. Tämä on kyllä veikeä joulupukki ...oikin hyvän tuulen tuoja! Terrific cards, Mervi, both of them. Delightful Santa image and beautifully coloured. Wonderful designer papers--love the colour combo. Thanks for sharing with us at the Fussy and Fancy Friday Challenge. 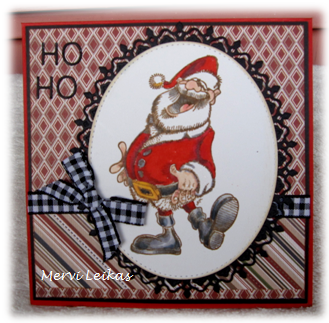 What fun cards, I love that laughing Santa! Thanks for joining in at CRAFT Challenge! This is such a great image - Santa looks like he's having such fun! Great papers too. Thanks so much for playing along with our Christmas challenge at The Male Room. Hope to see you again next year.